Financial Stress? What Financial Stress? What are organizations doing to help employees manage financial difficulties? SHRM (in collaboration with Elevate) explored this question in their recent survey “Employee Financial Stress.” They found that 61% of HR professionals would describe their employees’ financial health as no better than “fair,” where 38% would describe theirs as “very good” or “good.” Organizations that had more full time hourly employees were more likely to have a response of “fair” compared to organizations with fewer full time hourly employees who were more likely to report better financial health amongst employees. 50% of HR professionals reported that the age group most likely to experience financial stress was 25 to 34 year olds, though 29% reported that 35-44 years old experienced more financial stress. This makes sense as both age ranges reflect periods of significant life changes, such as starting a first job, buying a home and having a first child. If 61% of HR professionals would describe their employees’ financial stress as no better than fair, it begs the question as to what efforts, if any, organizations are making to help employees become more financially literate and skilled. 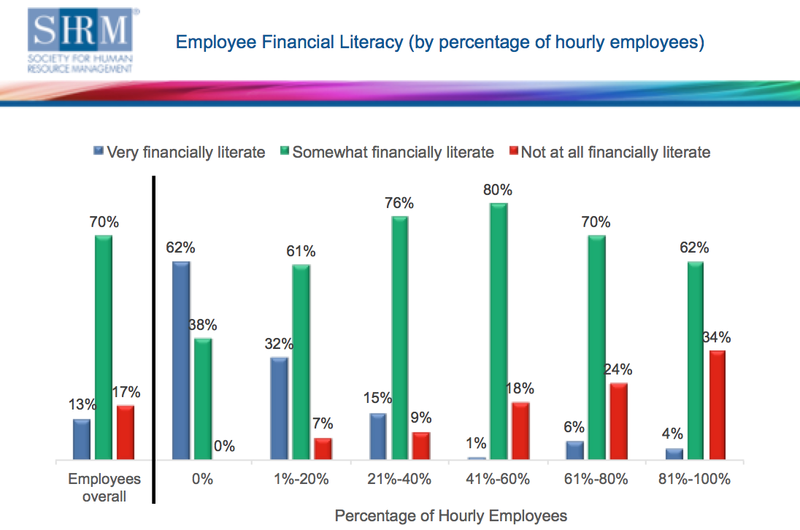 SHRM and Elevate’s survey found that 70% of HR professionals report employees being “somewhat financially literate,” and while 17% of employees are described as “very financially literate,” an additional 17% are considered “not at all financially literate.” We can cycle back to the initial question, then, of what organizations are doing to help employees manage financial stress? The research finds that 19% of organizations offer employees loan products from a third-party provider, and 18% of organizations offer payroll advances. Almost three quarters of HR professionals report that offering third-party provider loan products have a positive impact on employees’ overall ability to manage their financial difficulties. Slightly over one-half of HR professionals reported pay advances having a positive impact. When it comes to common services that organizations offer to employees to help manage their finances, retirement planning and consultation takes the top spot at 81% followed by financial literacy training for investing at 42%. Some, although few, organizations also offer financial services including financial literacy training for basic budgeting (25%) and credit score monitoring (8%). The fact that a combined 61% of HR professionals describe the overall financial situation of their employees as no better than fair (50% fair, 10% poor and 1% very poor) may hint that organizations should take a look at their financial benefits program and tailor it to the needs of their employees – for example, if an organization has a high percentage of Millennial employees, and the data suggest Millennials are experiencing the most financial stress, this could be a starting point. We can highlight too, that if this is the case, it could be a point for inter-generational workplace tension – if there are highly perceived financial differences amongst different demographic groups. Organizations might also consider some of the positively received but less prevalently used financial benefits. Understanding the personal financial stress points in your workforce will be a first step in providing meaningful support for a stressor that can derail productive employees.